TV crew of Republic of Lebanon came to our office. 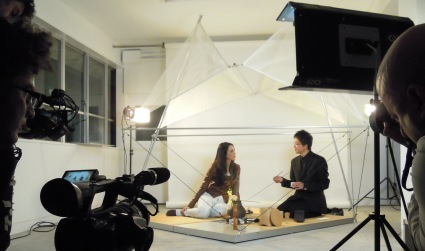 They said they recorded mixture of modernism and traditional in Tokyo. Prof. Suzuki made a Japanese tea for Ms. Bahnam as a tea master, and she enjoyed to habe it. TV show “DZN” was broad casted on 26th May 2010. Memorial photo, OPA member with Sabine-san, Roula-san, Hani-san, Ziad-san, Bon voyage.